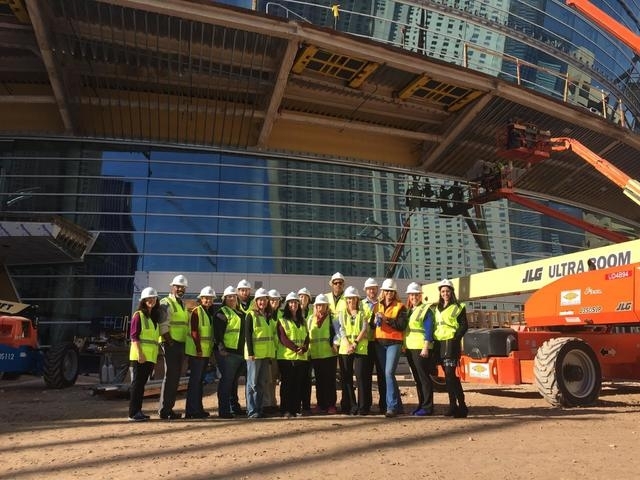 Membership at the Commercial Real Estate Women of Las Vegas (CREW-LV) is on the rise, a direct effect of the economic rebound. According to Becker, during the recent recession the nonprofit organization’s membership declined from 60 members to the low 20s. The organization completed a successful membership drive last fall, gaining 15 new members to bring the list past 45. “It’s taken us a while to rebuild,” Becker explained. CREW-LV is a local chapter of the national nonprofit dedicated to ‘advancing the achievements of women in commercial real estate’. It offers members a forum to network and find valuable business contacts. Although primarily targeting women, men are welcome to join. Membership is open to representatives involved with commercial real estate including lenders, brokers, architects, contractors, certified public accountants, attorneys and engineers. The Las Vegas chapter is one of 70 chapters across the United States representing more than 9,500 network members. A priority of the organization, Becker said, is being actively involved in the community. CREW-LV recently hosted its ninth annual fundraising event that raises money for the We Care Foundation, a local charity, with a small percentage of the proceeds going to fund CREW-LV. This year’s approach of staging the Classic Las Vegas evening event is new for CREW-LV. Previous fundraisers were fashion shows at different local venues. The event, held at the Las Vegas Country Club, featured Jesse Garon, the “Official” Elvis of Las Vegas, and his pink Cadillac. Coin Slot, a local band will perform sets before and after Garon’s performance. Besides the annual fundraiser, Becker said CREW participated in Race for the Cure on May 6 and will gather donations and volunteer for Shade Tree’s ‘Dress for Success’ as part of the annual membership drive this fall. One of the networking benefits of the organization is its ‘CREW for CREW,’ that connects CREW members to other CREW members across the country. Another networking option is its member luncheon on the first Thursday of every month. During the luncheon, speakers present a wide spectrum of topics, offering insight into the market or different local industries. As membership has grown, attendance at the luncheons has also increased. CREW-LV applicants are required to attend two CREW-LV events before submitting membership application. Annual membership dues are $290. Anyone interested in joining, call Leslie Becker at 702-539-2781.